Even the best hunters can agree that you are only as good as your equipment. Having the right equipment is therefore essential for a successful and enjoyable hunting trip. Riflescope’s are an important part of the hunting process, as they allow you to have increased accuracy when hunting targets at different ranges. Vortex has excelled highly in this area, offering hunters the opportunity of precise placement regardless of yardage and lighting conditions. The Diamondback 4-12×40 riflescope is an exceptionally popular innovation, which has been designed for big game, muzzleloader, predator/varmint, target, and long range shooting. So if you fall into one of these aforementioned categories, then theVortex Diamondback review below is definitely one that you should read. 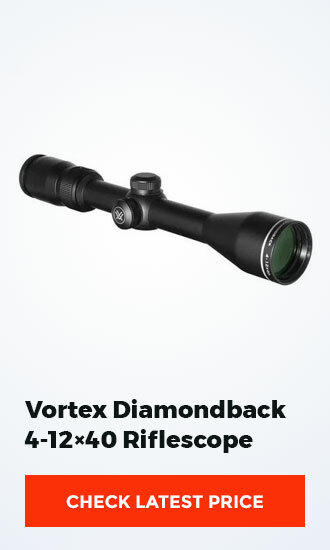 The optics of a riflescope is its most important feature, and I am therefore happy to tell you that Vortex Diamondback is renowned for its exceedingly clear optics. The fully multi-coated optics of this riflescope guarantee that clear and crisp images are visible through the crosshairs, so that you will have an undisturbed view of your target. Furthermore, the optics favor efficient light transmission, with the multiple coatings utilizing anti-reflective features for all air-to-glass surfaces. Additionally, Vortex acknowledges the fact that many hunters get frustrated when they have to guess windage and hold-over corrections. That is why the Diamondback riflescope is composed of a dead-hold BDC reticle, which has been specifically designed to take the guesswork out of hunting. This way your shooting will be more accurate. Another area in which the Vortex Diamondback has excelled is in the quality of construction. This riflescope is made using aircraft-grade aluminum alloy, which has been formed into a single solid piece. The rugged construction of the riflescope makes it nearly indestructible, and capable of withstanding all impact and magnum recoil experienced during your hunt. Additionally, the durable riflescope has a matte finish, which reduces glare so that your position can be camouflaged at all times. 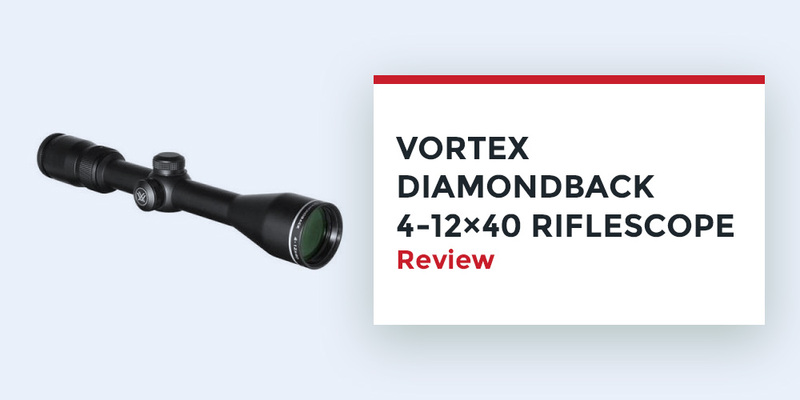 Vortex Diamondback 4-12×40 Riflescope ReviewAnother prominent feature of the Vortex Diamondback is its argon purging, which works to give the riflescope waterproof and fogproof abilities. Argon gas has special properties, in that it does not react chemically with water or absorb water. The presence of the argon gas in the riflescope therefore ensures that internal fogging is prevented across a wide range of temperatures. Additionally, the argon gas works with the O-ring seals to stop moisture from entering into the riflescope. These rings also prevent dust and debris from coming into the scope, in turn ensuring that the service life of your optics is extended. 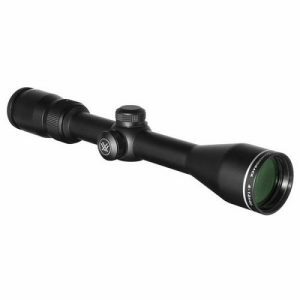 Vortex Diamondback 4-12×40 Riflescope ReviewWhen you are out hunting, one thing that you will need on your side is speed. If you are slow, you will miss your fast moving target and the entire day will be a waste. That is why the Vortex Diamondback boasts of zero reset accuracy, which allows for fast and accurate elevation and windage adjustments. In fact, these audible adjustments can be made with just the tips of your fingers for maximum convenience. The zero reset accuracy has also been machined for increased durability. The zoom lens mechanism of the Vortex Diamondback is composed of top quality components. More specifically, the zoom lens utilizes a precision-glide erector system, which works to guarantee seamless magnification changes even under the toughest conditions. Q: What is the max elevation adjustment and max windage adjustment of the VrotexDiamonback riflescope? A: The Diamondback riflescope has a max elevation and windage adjustment of 60 MOA. Q: What are the dimensions of the Vortex Diamondback riflescope? A: The riflescope is 12 inches in length and 14.6 ounces in weight, and has a tube that measures 1 inch. This riflescope is therefore lightweight and compact, reducing any fatigue that you may experience during extended hunts. As you can see, the 4-12×40 riflescope is definitely a Vortex creation that you need to own. This well-built and reliable Diamondback riflescope allows for precise and clear hunting so that your hunting experience is like no other. So if you are looking for an affordable and well-performing riflescope for your enxt hunting trip, the Vortex Diamondback is the way to go.